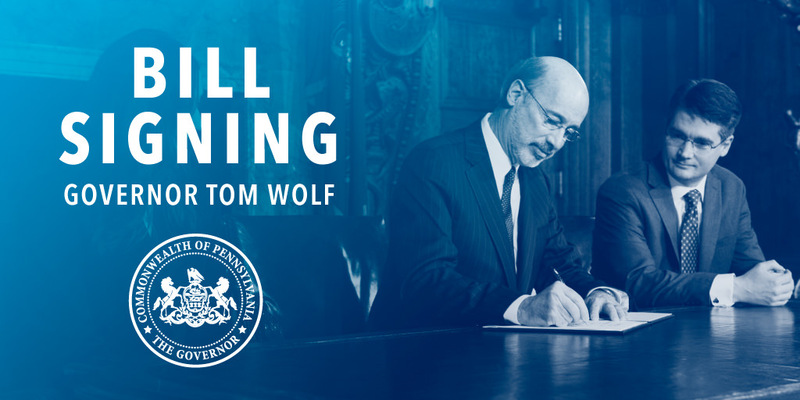 Harrisburg, PA – Today, Governor Wolf signed legislation to battle Pennsylvania’s heroin and opioid epidemic. This legislation will strengthen the Prescription Drug Monitoring Program, restrict the number of pills that can be prescribed to minors or in emergency rooms, establish education curriculum on safe prescribing, and create more locations for the drop-off of prescription drugs. Act 126 SB1367 (Yaw): This bill amends Title 35 (Health and Safety) to establish restrictions on physicians’ ability to prescribe opioids to minors, including limiting prescriptions to seven days and requiring physicians to take a number of steps before issuing the first prescription in a single course of treatment. This bill passed unanimously in the Senate on 9/28/16. Act 125 SB1368 (Killion): This bill establishes a safe opioid prescribing curriculum in medical colleges and other medical training facilities offering or desiring to offer medical training. The curriculum must include: current, age-appropriate information relating to pain management; alternatives to opioid pain medications; instructions on safe prescribing methods in the event opioids must be prescribed; identification of patients who are at risk for addiction; and, training on managing substance use disorders as chronic diseases. Act 124 SB1202 (Yaw): This bill amends the Achieving Better Care by Monitoring All Prescriptions Program (ABC-MAP) Act requires continuing education in pain management, addiction and dispensing for prescribers and dispensers. The Governor’s Office successfully passed an amendment that would require prescribers to check the ABC-MAP every time they prescribe an opioid or benzodiazepine. In addition, the Administration’s amendment would require dispensers to input prescription data to the ABC-MAP within 24 hours of dispensing. Current law gives dispensers (who are required to enter information into the ABC-MAP when they dispense an opioid or other controlled substance) 72 hours to log in and enter information. Act 122 HB1699 (Brown): This bill mandates that hospital emergency departments and urgent care centers may not prescribe opioids in quantities that last more than seven days and they may not write refills for opioid prescriptions. Act 123 HB 1737 (Maher): This bill would allow all federal, state and local law enforcement entities, hospitals, assisted living facilities, home health care agencies, long-term care nursing facilities, hospice, and commonwealth licensed pharmacies to serve as drop-off locations for any extra, unwanted, or expired prescription drugs or over-the-counter pharmaceutical products.